Salvatore SCIARRINO: Luci mie traditrici (1998). Cast includes: Nina Tarandek, Christian Miedl, Roland Schneider, Simon Bode. Ensemble Algoritmo, Marco Angius (cond.). EuroArts 2059038 (1 DVD) (http://www.euroarts.com/). With a third recording in hand (Kairos 0012222KAI is from 2001 and Stradivarius STR 33645 is from 2003), perhaps we can call Luci mie traditrici Sciarrino’s most popular opera. It is unquestionably comprehensible and absorbing, not just because it takes inspiration from Don Carlo Gesualdo’s sordid crime. Visuals can cement the flow and structure of new opera: A busy stage can distract from lagging music, and complexity can be elucidated when it becomes clear who is doing what. However, this opera, utterly compact with four distinctive singers, makes sense without images. It does enrich to see Miedl’s face which can pass between joy and vengeance in a flash. We see Sciarrino’s delicate quivering melismas, perhaps mannered, but indisputably natural and modern. We also spy a profusion of hands and open fans across the 69 minutes. Closed fans foreshadow the murder weapon. The instruments tap, breathe and flutter like an exotic menagerie. The crisscrossing Claude le Jeune material (from 1608) fits seamlessly. Sciarrino replaced the initial Gesualdo allusions when he learned that Schnittke was working up the same subject. A 33-minute documentary completes the package. 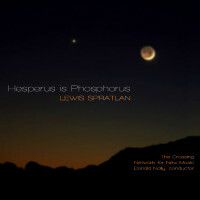 Lewis SPRATLAN: Hesperus is Phosphorus (2012). Network for New Music, The Crossing, Donald Nally (cond.). Innova 894 (1 CD) (http://www.innova.mu/). Last century, most American composers staked their identities on the serial-atonal-Schoenberg camp vs. the populist-tonal-Stravinsky camp. There were those who didn’t bother choosing sides, and an even smaller group drank up all of it. Spratlan is among this smallest collection, comfortably blending Webernian dissonance with jazz, winning melodies with smart organization. There are gentle polystylistic touches: A mention of Mahler in the text permits an elegant, fleeting reference easy to overlook. Hesperus is Phosphorus is a Vespers cantata for chorus and six players (clarinet, French horn, violin, cello, piano and percussion). Once explicated, the puzzling title encapsulates the topic: The Greeks thought the morning star Phosphorus was different from the evening star, Hesperus, until they realized they were one and the same. This engrossing 68-minute cantata ruminates across such realizations about life and afterlife. Spratlan has set prose texts by David Eagleman, Richard Feynman and poems by Wallace Stevens, A.R. Ammons and Adrienne Rich. The recording could have crisper definition for the chorus. 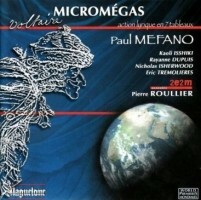 Paul MÉFANO: Micromégas (1983-87). Cast includes: Nicholas Isherwood, Kaoli Isshiki, Rayanne Dupuis, Eric Trémolières, Pierre Villa-Loumagne. Ensemble 2e2m, Pierre Roullier (cond.). Maguelone MAG 111.170 (2 CDs) (http://www.maguelone.com/). In Voltaire’s fantastical 1752 story set in seven scenes, the giant Micromégas inadvertently discovers tiny life on Earth which to his amazement possesses language and philosophy. There are parallels to the satiric logic we find in Swift’s Gulliver’s Travels in that the huge giant can’t see humans, so therefore presumes that they don’t exist, but when he finally notices people, he presumes they are inconsequential because they are so small. It doesn’t help that Voltaire’s idea of philosophy is riddled with tautologies. The French-only libretto obscures a lively opera, including a speaker and chorus who comment upon the action. Voltaire added contemporary references (“He and his men poked fun at them at first, like Italian musicians laughing at the music of Lully…”), and Méfano includes recurring tonal leitmotifs although his style remains contemporary with microtones amid ample percussion. I think I hear electronics, but can’t be certain. Hesitantly recorded on the low end, a DVD to convey Méfano’s pleasure at setting the text would be welcome. An instrumental movement, Voyager, was extracted for 2e2m’s collection, Paul Méfano, Vol. 1 (2E2M Collection 1006). 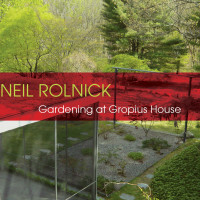 Neil ROLNICK: Gardening at Gropius House (2012)1; Anosmia (2011)2. Todd Reynolds1 (vln), Maya Kherani2 (sop), Carrie Zhang2 (alt), Daniel Cilli2 (bar), Neil Rolnick1,2 (laptop computer), Alarm Will Sound1, The New Music Ensemble of the San Francisco Conservatory of Music2, Alan Pierson1, Nicole Paiement2 (conds.). Innova 877 (1 CD) (http://www.innova.mu/). Back when Gropius lived in Concord, Massachusetts, in the house he designed that now bears his name, Rolnick’s summer job was to maintain the grounds. The famous architect challenged him to clear a field, but Rolnick gutsily refused believing the given natural beauty was preferable. (Today the land around the compact residence has been tamed. There is no house quite like it in the area.) This half-hour violin concerto with electronics suggests a corresponding wildness, ideas running rampant, and gestures that stray across borders. There’s also an indifferent conflict between tradition and modernity. Yet the work is personal, as Rolnick has often replayed the stimulating chats he had with Gropius that summer. Anosmia is a half-hour cantata about losing one’s sense of smell. As terrifying as the narrative’s prospect may be, the whimsical treatment includes paired soprano and alto acting as backup singers to the narrating baritone. Ironically, the piece would be perceived completely differently if the rambling text weren’t comprehensible, even if it does effectively express the fear of drastic physical change and loss. 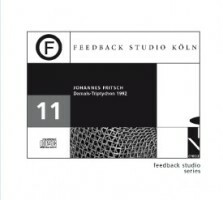 “Damals-Triptychon.” Johannes FRITSCH: Das bittersüße Büchlein (1992)1; Damals (1992)2; Trio vom Ende (1992)3. Trio Akkobasso: Amy K. Goeser1 (ob), Heike Storm1 (accordion), Eberhard Maldfeld1 (cbs), Dieter Wernecke2 (speaker), Bernhard Haas2 (org), Stephen Grant3 (bar), Camilla Hoitenga3 (a-fl), Jonny Axelsson3 (perc). Cybele Records CD 960.311 (1 CD) (http://www.cybele.de/). At the center of Fritsch’s “That Time” Triptych is a rendition of Beckett’s That Time for speaker and organ lasting nearly 45 minutes. Following Beckett’s instructions, the spoken words are presented from three positions: left, right and center, and thus from a projected tape. The organ mirrors the spoken syllables constrained to a narrow tessitura. There are silences between clauses and sentences. The entirety is measured and weighty. The same can be said of the shorter surrounding pieces. The Bittersweet Little Book is scored for the unlikely combination of oboe, accordion and contrabass. The un-nuanced accordion blends improbably with warmer oboe and bass. Trio vom Ende reuses content from Damals, however at a slower pace. More conventionally scored for baritone, alto flute and percussion, it may be the collection’s most traditional offering. Allen ANDERSON and Brooks DE WETTER-SMITH: Iceblink (2013). Terry Rhodes (sop), Tonu Kalam (narr. ), North Carolina Camerata, Michael Votta, Jr. (cond.). Centaur CRC 8001 (1 DVD) (http://www.centaurrecords.com/). Here’s a “meditation on Antarctica” with music and spoken texts (Captain James Cook, Herman Melville, Pablo Neruda, Sara Vial, Louis Bernacchi, et al.) combined with dramatic stills and video. Yes, there’s a lot of ice and snow, and so the tones are predominantly whites, blues and greys. No people appear, but there are penguins. We get to spy upon an inaccessible place and so the mind wanders to thoughts of isolation, frontiers and perhaps even how the planet is inevitably changing. Scored for flute, clarinet, violin, viola, cello, bass, harp, percussion and soprano, Anderson’s seven-part opus is correspondingly cool. De Wetter-Smith, who travelled to Antarctica in 2006 to take the pictures, is also the ensemble’s flute player. The actual video is 44:30 and there’s a 10:20 behind-the-scenes mini documentary. James M. STEPHENSON: The Devil’s Tale (2013). 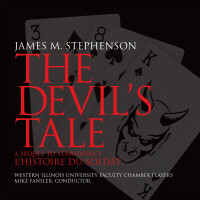 Western Illinois University Faculty Chamber Players, Mike Fansler (cond.). Ravello Records RR7906 (1 CD) (http://www.ravellorecords.com/). Stephenson elegantly extends the spirit of Stravinsky’s parable, adding a few twists and turns. L’histoire’s instrumentation persists (violin, bass, clarinet, bassoon, trumpet, trombone and percussion, with narrator and conductor), but the style is modern and tuneful. Instrumental numbers interweave with narration and we’re always wondering what will happen next. Robert Kurka’s bustling The Good Soldier Schweik comes to mind. Kudos to narrator Matt Bean who carries all three parts: Joe, the musician, Sam, the evil blackjack dealer (the Devil), and Hannah, the showgirl who slips between them. Palindromes play a crucial part, as we realize Stephenson’s work could be prelude or sequel to Stravinsky. 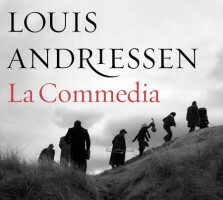 Louis ANDRIESSEN: La Commedia (2008; with electronic music by Anke BROUWER). Cast includes: Claron McFadden (sop), Cristina Zavalloni (voice), Jeroen Willems (voice), Marcel Beekman (ten), Dutch National Opera, Asko Ensemble, Schönberg Ensemble, Reinbert de Leeuw (cond.). Nonesuch 534877-2 (2 CDs, 1 DVD) (http://www.nonesuch.com/). Audio only, La Commedia’s five parts (“The City of Dis, or The Ship of Fools,” “Racconto dall’Inferno,” “Lucifer,” “The Garden of Earthly Delights,” “Luce Etterna”) are long indeed (63:55 + 40:17). With the visuals (1:45:23), this “film opera” becomes narrowly less exasperating. We see a stage production incorporating Hal Hartley’s projected film, and the score’s stylistic shifts correspond to onscreen events. The text is predominantly Dante, original and in varied translations. Italian, Latin, Dutch and English are sung in Andriessen’s typically hammered rhythms. La Commedia is possibly the darkest and soberest Andriessen work I’ve heard. What else would you expect for a tour of Hell? I do not understand the role of the street musicians in the film, except for the Bergman allusion (see the cover). The music is unmistakably Andriessen with prominent brass and winds and sly genuflection to Stravinsky and Berio. I suspect a gigantic joke lurking here, and the final snide children’s chorus implies as much. The work is dedicated to Andriessen’s wife, Jeanette Yanikian, who died in 2008.